This Small Hanging Toiletry Bag is a scaled down version of one of our popular toiletry kits. Perfect for any traveler, it gives you a compact way to store all your toiletries wherever you go. 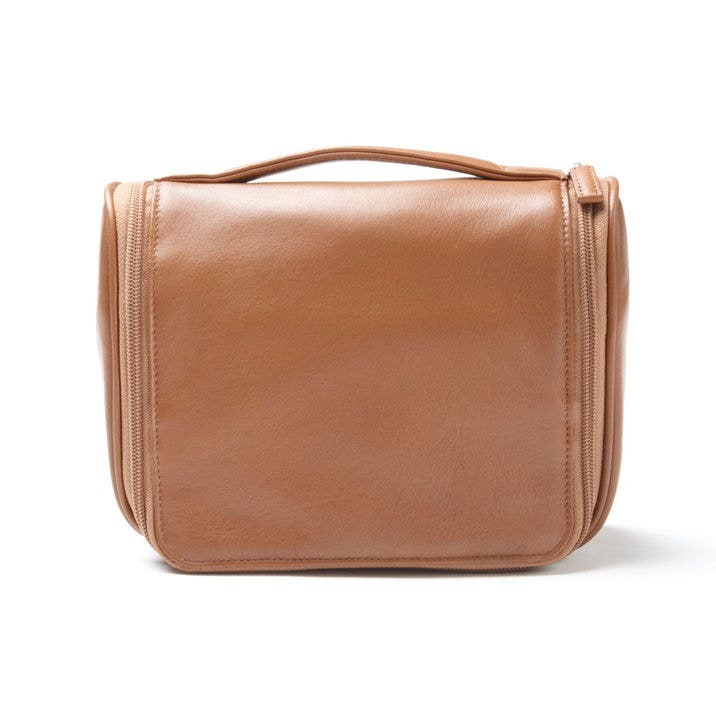 Made from genuine leather with a water-resistant nylon interior, our Small Hanging Toiletry Bag zips open to reveal a large compartment for your travel soap, shampoo, toothbrush, and other essentials. We also include 3 mesh pockets inside for storing small items and an extra zippered pocket on the front, giving you even more storage space. A hanger extends from the top of the inside flap, letting you easily hang your bag from a towel rack or shower rod wherever you're at. Great for overnight stays or lengthy trips, our Small Hanging Toiletry Bag is sure to become one of your go-to accessories. My recent purchase arrived earlier than predicted. As always, wonderful packaging and beautiful quality! My go to gift shopping! Sale item was perfect too! A decent bag that is very functional albeit slightly too expensive. We celebrated our 3rd wedding anniversary. The tradition for 3rd anniversary gifts is leather. I bought a personalized toiletry bag for my husband. The leather is beautiful! And the gold embossed monogram was the cherry on top. Such a classic timeless piece. Thank you for making such a beautiful gift! I will be buying something for myself from Leatherology. Love the products and the packaging was a pleasant surprise!! It is cute and quality made. It was exactly what I was looking for. Thank you! I go to the gym everyday and travel domestic as well as internationally this bag fits my lotions, moisturizers (day & night) shampoo, conditioner, shaver, hair ties, and more. It has small compartments to put things you might not think about and it is the perfect size and doesn't take up much room in any gym bag or carry on. If you like quality then this is the bag for you. I am thinking of buying another one just in case this one ever falls apart. Really good quality and accurate description. I ordered several items from Leatherology and have been so satisfied with the entire process. My daughter loved the Toiletry bag in cognac that I sent together with makeup bag and tissue holder. Everything arrived on time and beautifully wrapped. I have been telling everyone about Leatherology and I will be a customer for life. My Son-in-law also loved his toiletry bag in cognac. Thank you! Leatherology delivers a Top Shelf product! Not only this toiletry bag itself, but the way it's packaged. This fine leather bag is placed in a suede bag inside a nice box with black velvet ribbon... No need to wrap in Christmas paper. This is the third red leather item purchased over past 6 years. Two for my wife and this gift for our daughter (22 yrs old). Quite sure she's going to love it. We'll see in 10 days!! !